This morning, the Reuters Institute at Oxford has published a new piece of research, authored by Nic Newman: The Future of Voice and the Implications for News. Sadly, the net result of this shift is a lot of time and effort is being wasted on platforms which do not, and may never deliver the returns we might want. And early research like this makes that less likely, allowing publishers to make smarter decisions. The smart speaker platform is only just over three years old, with the Amazon Echo releasing in the US in June 2015. Google and Apple are in the market now. 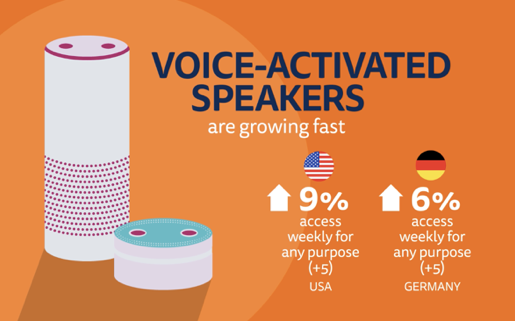 Clearly smart speakers are a platform that's worth paying attention to, given the remarkable growth of home penetration of these devices. But are they worth investing time and money in yet? In short - it's a growing market, and one that bears watching — but you shouldn't necessarily feel pressured to be there right now. Your strategic development resources might well be better invested in more mature platforms. Let's address the latter point first. It's worth noting that new interfaces rarely replace old interfaces, but instead tend to be additive. The mouse added to the keyboard. Touch displaces the mouse, but the keyboard is still in play on touch devices. Voice is likely to come into play when you are issuing simple commands, or requesting simple information. For example, one key use of speakers is to control connected home devices. If you've filled your home with smart light bulbs, it's much easier to ask a speaker to dim the lights, or change their colour, than it is to mess around with an app. The US publisher Quartz has been experimenting with short question and answer text formats in its mobile app, but it may be that voice will ultimately be a more satisfying – or just an additional – output. Ultimately these formats could be applied to any number of news and current affairs subjects but success will require platforms and publishers to work together over time both to create valuable experiences and to educate users. It could be that we're in the "shovelware" stage of development for the platform. People are pushing variations on the traditional radio bulletin format onto the platform, while what might actually prove more compelling is a more interactive experience that you can navigate with you voice: the speaker offers you a limited, curated choice of top stories and you pick and choose what you want to hear. If you have the time, resources and will to experiment in this area there could be a first mover advantage - unless the incumbency factor proves too strong. And the whole question of monetisation has been dodged so far. Even worse, the report makes it plain that all three main smart speaker vendors are not providing useful analytics about consumption levels. In particular, they are not disclosing any sort of useful contextual data that would allow publishers to assess how successful their offering had actually been. The Guardian is using Google funding to run a Voice Lab for six months (from November 2018).12 A product and editorial team of four will test a range of propositions around synthesised voices and interactive formats. The team will manage a weekly blog where they share learning with the rest of the industry and useful code that emerges will be open-sourced. I'd recommend watching that experiment with interest. You can grab the whole report from the Reuters site.